Christopher Robin and Winnie-the-Pooh are unique among the most widely loved storybook characters of all time. They were actually real. Until I previewed the movie Goodbye Christopher Robin, I did not know that the Winnie-the-Pooh stories by A.A. Milne were based on a real person. And the assortment of animals such as Piglet, Eyore, Tigger, Owl, and friends, were the stuffed animals of Christopher Robin in real life. These days, fame has pulled the childhood out from under many young actors. But in the early 1920’s in the idyllic English countryside, it would seem that Christopher Robin should have been safe from reality stardom. However, his father’s great success with the books Winnie-the-Pooh (1926) and The House at Pooh Corner (1926) took the adventures of Christopher Robin into the public eye—a place the young boy would rather have not gone. Thus, there were ramifications. The movie itself is interesting with elements both heartwarming and heartbreaking. In this age of reality, it is probably time for us all to know about the true inner lives of Winnie-the-Pooh and friends: writer A.A. Milne (Domhnall Gleeson), his wife Daphne (Margot Robbie), and their son, Christopher Robin (Will Tilston & Alex Lawther), and the nanny, Olive (Kelly Macdonald). Despite the cozy fantasy world of Christopher Robin that our children and we indulged in, his parents were rather lousy. Thankfully he had a nanny who loved him and mostly took care of him. Milne’s suffered PTSD from his time serving in World War I, although such things were not diagnosed back then. It was while taking breaks from his writing that Milne played with his son in the woods and came up with the idea to write about Winnie-the-Pooh, which became the most successful children’s series in the world at that time. If you are the type who likes to know the story behind the story, you will likely enjoy this movie. I did and so did my now-grown daughter to whom I once read the adventures of Winnie the Pooh. 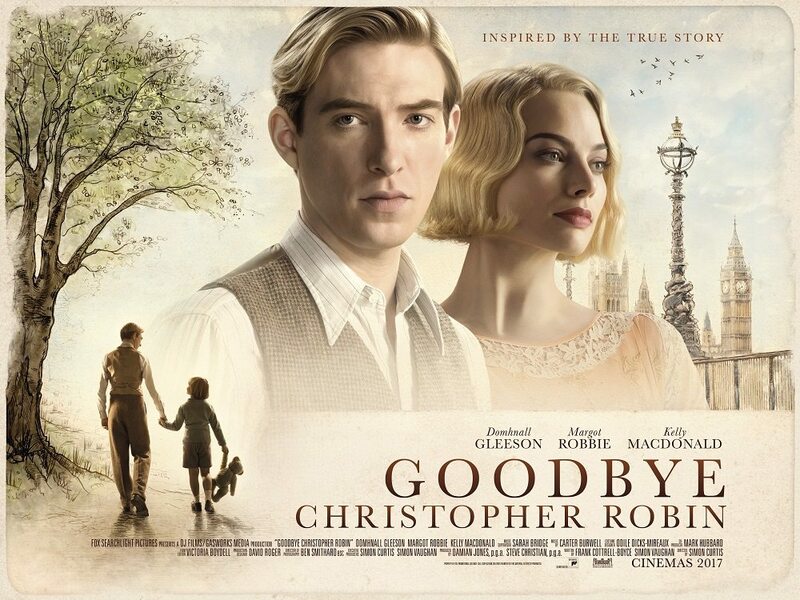 Goodbye Christopher Robin is rated PG and opens in theaters Friday, October 13.